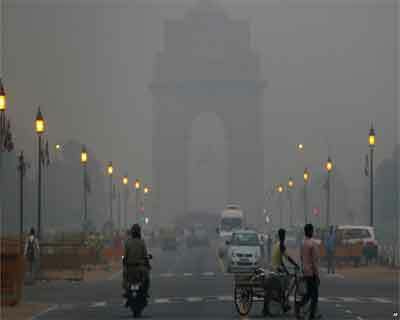 NEW DELHI: Cases of severe breathlessness, asthma and allergy have sharply risen in Delhi as the city remains blanketed in thick layer of toxic air due to the worst smog in 17 years. Doctors and experts say that besides spike in fresh cases, health complications have aggravated in people having a history of asthma, allergy or other related ailments. “Earlier 15-20 per cent pollution-related ailment cases were reported at our hospital. But now these have gone up to 60 per cent. Bronchiolitis is inflammation of the bronchioles, the smallest air passages of the lungs. “Children and elderly are the most vulnerable to infections and allergies due to smog and pollution. So, they should take extra care, and try not to venture during early morning and at dusk when the toxic level is highest,” Byotra says. Delhi is facing its worst smog in last 17 years, prompting the high court to observe that it was akin to “living in a gas chamber”. The Centre has termed it an “emergency situation” and called a meeting of environment ministers of all neighbouring states tomorrow to curb stubble burning by farmers. According to experts, it is estimated that over 20 per cent of the world’s population suffers from allergic diseases such as allergic asthma, allergic rhinitis and allergic conjunctivitis, atopic eczema and anaphylaxis. “We are seeing a rise of 60-70 per cent in ailment cases related to pollution. Breathlessness, asthma, eye and skin allergies case have jumped. We are getting patients as young as a two-month-old baby who had bronchiolitis. “People who had a history of or are predisposed to such ailments, such cases have also risen. Children getting affected more, as their immunological state is low. Besides, the infections are taking longer time to subside,” says Dr Rahul Nagpal, Director and Head, Pediatrics, at Fortis Hospital in Vasant Kunj. “Children should as far as possible avoid venturing out in the open early morning and late evening, and peak hours of the pollution. The number of cases have increased due to the smog in the last few days,” says Dr V K Paul, pediatrician at AIIMS.